The UK Gambling Commission is changing the rules for online casinos. From 31st October 2018 onwards, only forfeitable bonuses will be allowed in UK casinos. 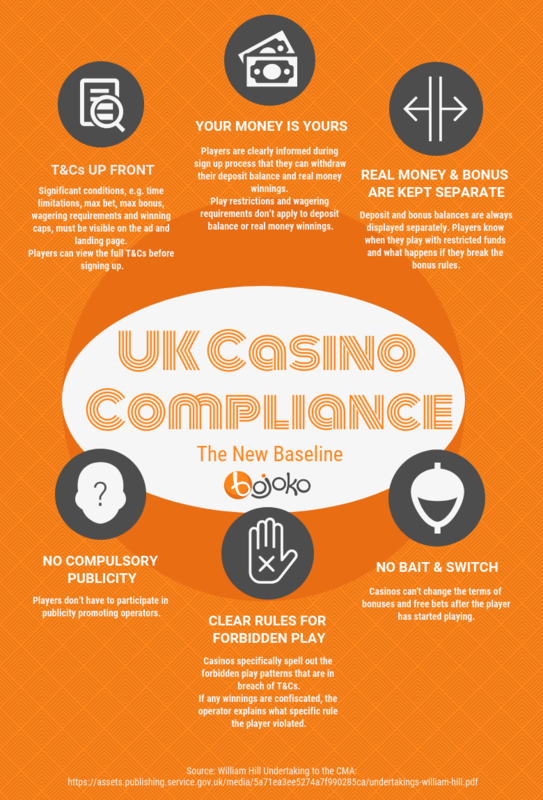 We asked all our casino partners about these new rules and what they’ll be doing to comply. Here's what they revealed. Don't worry, casino bonuses aren't actually dead yet. The UK Gambling Commission just needed to make the rules governing bonuses fairer and more transparent. Here's the biggest tweak: starting 31st October, all bonuses offered in UK online casinos must be forfeitable. Players need to be able to withdraw their deposit and real money winnings, even if they've accepted a bonus. Some operators fear this demand will increase bonus abuse. 7% of casinos said they'll stop offering bonuses altogether. It's likely we'll see some decline in bonus sums as well. Alas, many licensees don't have a clear idea yet of what full compliance should look like. 57% said the Gambling Commission could have explained the practical changes better. The changes to the UK Gambling Commission’s licensing conditions are not happening in a vacuum. The Commission has received multiple consumer complaints concerning unfair business practices in the online casino industry. In 2016, the gambling regulator asked the Competition and Markets Authority (CMA) to step in and launch an investigation into this. CMA’s research uncovered many practices that are prevalent in the iGaming industry and, in their view, in conflict with standard marketing regulation. The most notable of these has to do with players’ inability to withdraw their deposit and real money winnings. According to CMA’s interpretation, deposited funds and winnings made with real money bets constitute an enforceable debt: that money belongs to the player, period. In practice, this would make all but forfeitable bonuses unacceptable in British casinos from the end of October onwards. Even if you've accepted a bonus, you’ll be able to cancel the bonus money, skip the wagering requirements and withdraw your real money balance at any point in the game. According to CMA, all this creates an imbalance between a casino and its players. And it needs to change. Regulators haven’t just been pointing out problems; they're also demanding operators fix the issues. In 2017, UKGC took enforcement action against five licence holders. This year, the gambling watchdog levied hefty fines on casino and sportsbook operators who sent marketing materials to self-excluded problem gamblers. To tackle these problems by setting a positive example, the Gambling Commission secured a commitment from three leading UK operators. In February 2018, William Hill, Ladbrokes and PT Entertainment (the company behind Titan Bet) duly promised to mend their ways. Players can easily see the significant bonus conditions (time limitations, who qualifies, maximum bet, maximum bonus, wagering requirements, sticky bonus, winning caps) on adverts and landing pages. There must also be a link to the full terms and conditions of the bonus. Players can view the full bonus T&Cs before signing up. Deposit and bonus balances are always displayed separately. Players know when they play with restricted funds and what happens if they break the bonus rules. Players are clearly informed during the sign-up process that they can withdraw their deposit balance and real money winnings. Play restrictions and wagering requirements don’t apply to the deposit balance or real money winnings. Forbidden play patterns that are in breach of T&Cs are specifically spelled out for players. If players' winnings are confiscated, the operator explains what specific rule the player violated. Sportsbooks can’t change the conditions of free bets after a player has started placing qualifying bets. Players don’t have to participate in publicity promoting operators. Players need to explicitly opt in for any promotions. These measures are meant to be the new baseline for all gambling operators across the sector. Already in February 2018, the CMA and the UKGC were warning laggards that non-compliance will result in regulatory action. Now the rules have been formalised. The UK Gambling Commission published the changes in its Licence Conditions and Codes of Practice (LCCP) at the end of July. The deadline to implement the changes is 31st October 2018. Technically speaking, the Gambling Commission guidelines are not legally binding. The final verdict on whether a particular term infringes the law is up to the courts. If the online gaming industry doesn’t uniformly adopt the new approach, we may soon see how far the interpretations of CMA and the UKGC will hold. Bojoko wants to pave the way for a fair and safe online gaming landscape. That’s why we decided to ask all our casino partners how they perceive the new rules and what they're going to do to ensure compliance. In an online survey sent to over 250 casinos listed on Bojoko, we placed our finger on the pulse of the industry. With 10 questions concerning the new rules and their implementation, we got some interesting results. Most casinos welcome the changes to the industry. The positive example set by BGO and the three big UK operators were especially welcomed. A whopping 93% of casinos surveyed said they could commit to them as well. These steps are likely to raise the reputation of online casinos in general. But there’s still room for improvement. According to the UK Gambling Commission’s statistics from 2017, only 33% of people think gambling is fair and can be trusted. 41% of UKGC respondents thought that gambling is associated with criminal activity. While the public image of the industry should lighten up, some casinos fear that the changing regulation will eat away at their profits. According to one respondent, the ban on non-forfeitable bonuses is likely to attract more bonus abusers. This fear seems valid, as bonus abuse is already a problem, both in the UK and abroad. The industry has to find a balance between deterring fraudulent behaviour, appealing to legit players and complying with the updated regulation. That’s no mean feat. Players being able to withdraw their real money deposits and winnings will likely make bonuses less profitable for casinos. While being a welcome change for the customers, the new rules will probably cause casinos to lower the amount of bonus money and free spins offered to new players. More gamification and loyalty programs. These are the most popular measure, with over half of the casinos surveyed planning to implement them in the future. More games. 35% of casinos are looking to expand their game offering. With established game suppliers constantly publishing new slots and casinos adding new game providers, this figure is probably a conservative estimate. Better terms and conditions. The new regulation calls for fairness and clarity; many license holders intend to comply. More banking methods. There are already plenty of options for British players, and the number will likely increase. This is good news for many players, and should be welcomed by casinos and affiliates alike. With the competition shifting away from unsustainable bonuses, the operators can focus on building a quality product. This approach should also help create long-term value for players, which in turn will be rewarded by better customer retention. Win-win-win. According to the updated licensing terms, players need to be able to withdraw their deposit and real money winnings without any strings attached – even if they've accepted (but not started to play with) bonus money. In casino lingo, this is known as a forfeitable bonus. Whereas some casinos still make the real money winnings irrelevant by locking your own dough behind wagering requirements, in the UK this is soon going to be a thing of the past. Many operators have already updated their bonus terms to reflect the change. 50% of the respondents said their bonuses are already forfeitable; many ensured they’ll soon follow suit. While analysing new casinos listed on Bojoko, we have observed a similar trend in the last few months. Some casinos (7% of our survey takers) will probably stop offering bonuses altogether. For their players, bonuses are indeed becoming history. What the rest are going to do is another matter. 21% of respondents said that they’ll wait and see what others are going to do first. 64% of casinos surveyed are also looking to change the ways in which they deal with affiliates. The new rules make licensees responsible for all promotion done in their name, sites like Bojoko included. Our approach has been to give casinos full control of their brand, as long as the information imparted is accurate. This practice will likely become the norm in the future. While researching this subject matter, we carefully went through the UKGC Changes to the Licence Conditions and Codes of Practice, and the undertakings promised by the leading UK operators. These should clearly tell casinos what compliance looks like, but we found them confusing. And we're not alone. 64% of the respondents thought that the new conditions are not easy to implement. 57% said that the Gambling Commission could have done a better job explaining what specific practices need to change in order to be compliant. UKGC and CMA have published layman-friendly material, like the video above. However, these are targeted at the consumer and general public, not the industry. When the Gambling Commission was preparing the regulation update, industry representatives asked for examples and rule templates to make the minimum level of compliance clearer. Alas, these haven’t been published, and there are less than 6 weeks to the compliance deadline. Without practical and detailed instructions, the £5 billion UK online gambling industry has to play it by the ear. However, with the new tune being sung since January, the key notes should be clear by now. A history buff, bon vivant and live casino aficionado who's still really bad at blackjack.